BBC America's cult sci-fi series Orphan Black will return to our screens next April (2016) for its fourth season and the first teasers are beginning to drop. Fans received a decidedly creepy Christmas present last week in the form of a brief clip that consisted of a close up shot of a bionic eye accompanied by some unnervingly intimate breathing. The logical assumption would be that this is the new eye of nefarious clone Rachel Duncan - whose real eye received the pointy end of a pencil in the season 2 finale. Anyone hoping that the newest Orphan Black season 4 teaser would reveal more clues to this plot hint will have to settle for more illusive marketing. The latest TV spot released is no less sinister in tone but reveals something a little more substantive: a new clone character with a meaningful disguise. Take a look for yourself in the video shown above. Orphan Black is led by the astoundingly talented Tatiana Maslany whose pivotal ability to bring authenticity to the many characters she plays allows the showrunners a great deal of creativity in exploring the concept of clone sisters seeking answers about the purpose of their existence. The show examines its subject matter through the lenses of science and theology and raises questions of morality about human genetic enhancement. Maslany has played ten (and counting) clone “Sestras” on the show including clone captain Sarah, soccer mom Alison, unstable Helena and scientist Cosima. She is supported by Jordan Gavaris (Felix), Maria Doyle Kennedy (Siobhan Sadler) and Kristian Bruun (Donnie Hendrix) in recurring roles. The chase sequence we see in the Orphan Black season 4 TV spot above has a tongue in cheek surprise at the end, as the unknown figure (aka "M.K.") 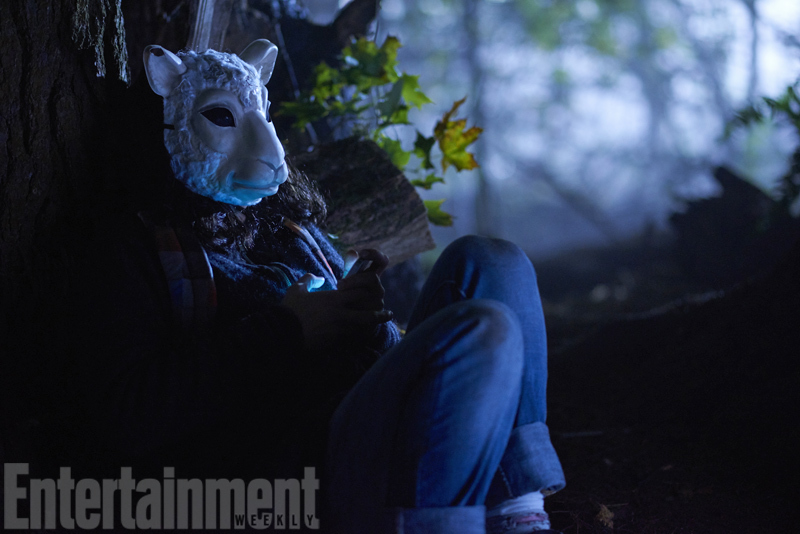 finally reveals her face - only for it to be disguised by a mask that has the face of a sheep (see the images above). This is a visual metaphor that nods to the most famous symbol of real cloning technology, Dolly the sheep. Said Rachel teaser hinted that the convoluted story lines of season 3 have inspired a revisit of older material - that is, a renewed Neolutionist threat perhaps that would support Rachel's last scenes in the season finale. By comparison, this new Orphan Black season 4 teaser focuses on a fresh story line that lies ahead in a typically illusive fashion. Regardless of whether Orphan Black manages to retain the quality of earlier seasons as its world expands, it will remain a treat to watch Maslany bring her collection of clone women to life - and see what she will bring to the table through this new character, "M.K".